I didn't know this about Albuquerque! A thief took the plaque! Item excerpted from the Albuquerque Journal Business Outlook section, 14 September 2006: the circa 1950s building that housed the original Microsoft principals, Bill Gates and Paul Allen, is for sale in Albuquerque NM. The piece states that the real estate agent in question is marketing the property as "owning a piece of history." A plaque on a rock stands in front of the building where Paul Allen and Bill Gates got their start. Leaving offerings of old mother boards and floppy disks is uncool for the environment. In April 2012, police were investigating the plaque's disappearance. 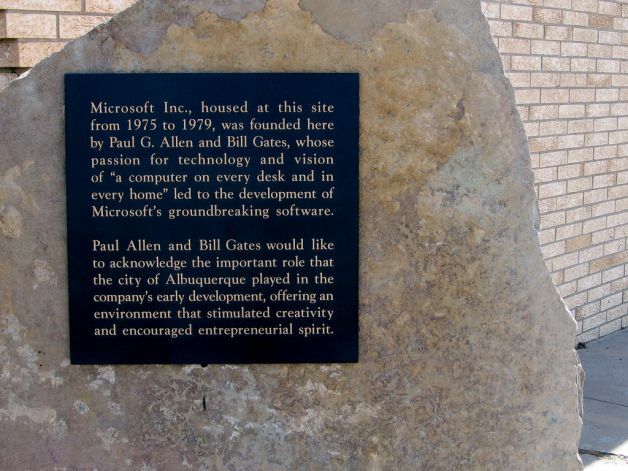 In a statement, Paul Allen said, "I've got great memories of working long hours in that office, and Bill and I were happy it was there as a way to thank the city of Albuquerque for its role in starting Microsoft. I can't imagine why someone would want to steal it. If it doesn't turn up, I'll make sure it gets replaced and installed in a more secure fashion."